Thursday January 31st 1901. I helped the boys put on another big load of furniture this morning and they took one load of straw. As soon as they started I helped Ed Stockman load the poultry it brought me $16.60. I had bread baking and a lot of things to do. I got the butter ready to go tomorrow. The boys took a stove to put up in the house at Coralville. Friday February 1st 1901 The boys took wood & straw today. I wrote a letter to Mother. We hear she is not well and Lee is worse. We are very anxious about them. I did some baking today and a little sewing in the afternoon. 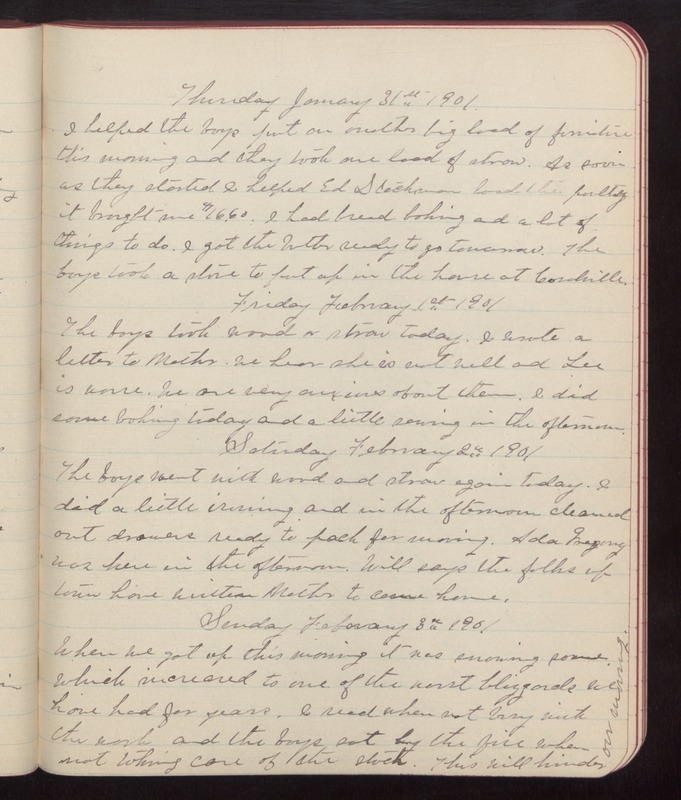 Saturday February 2nd 1901 The boys went with wood and straw again today. I did a little ironing and in the afternoon cleaned out drawers ready to pack for morning. Ada Gregory was here in the afternoon. Will says the folks up town have written Mother to come home. Sunday February 3rd 1901 When we got up this morning it was snowing some which increased to one of the worst blizzards we have had for years. I read when not busy with the work and the boys sat by the fire when not taking care of the stock. This will hinder our moving.